Create a home environment designed to make living easier with modern and contemporary electric fireplaces from Napoleon. Make a statement with this sleek system. The 42-inch Allure electric fireplace features reliable high power LED technology with realistic flames and a Crystaline ember bed. This wall mount electric fireplace heats from the top of the unit to allow you to recess the fireplace into a wall or to simply hang it with the included bracket and plug it into any 120V outlet. Customize your fireplace by choosing from one of three color settings for the ember bed. Sleek and stylish, the 42-inch wall mount fireplace can be hardwired directly. The included remote allows you to adjust the fan, set the temperature, use the timer to control the time of use, turn the fireplace on or off, and adjust the heat output and flame intensity from the comfort of your chair or across the room. With up to 5,000 BTUs, the 1500 watt electric fireplace is suitable for any room in your home. If you’re looking for a modern and contemporary fireplace, Napoleon’s Allure Electric Fireplaces are for you. The sleek and stylish design features a Crystalline ember bed and is powered by high intensity LEDs for more realistic flames. We love that you can choose between the three color flame options (Blue, Multi-Color, and Orange) to complement your room décor or your mood. No matter the size of your space, there is a Napoleon Allure Electric Fireplace for you. From 32-Inch up to 100-Inch, there are 6 different size options. 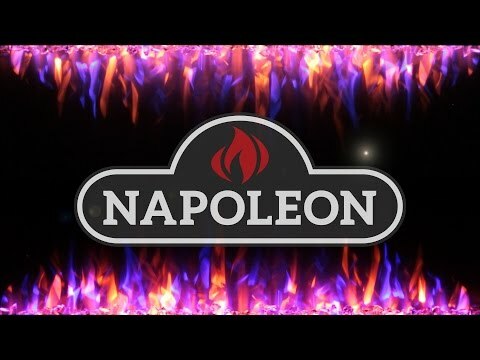 Napoleon electric fireplaces are designed to make living easier. The fan, temperature, timer, power, heat output, and flame intensity are all adjustable with the included remote or the touch screen control panel. Since the heat blows from the front of the fireplace, it can be recessed into your wall, as well as hung with only a 5” protrusion off the wall thanks to the ultra-slim design. A paintable cord cover is included to help your Napoleon electric fireplace fit seamlessly into your space. This electric fireplace has a more modern look with a Crystaline ember bed and three flame color options. 42" 51 3/16" 40" 24"
400 Sq. Ft. 150 Sq. Ft. 1,000 Sq. Ft. 1,000 Sq. Ft.